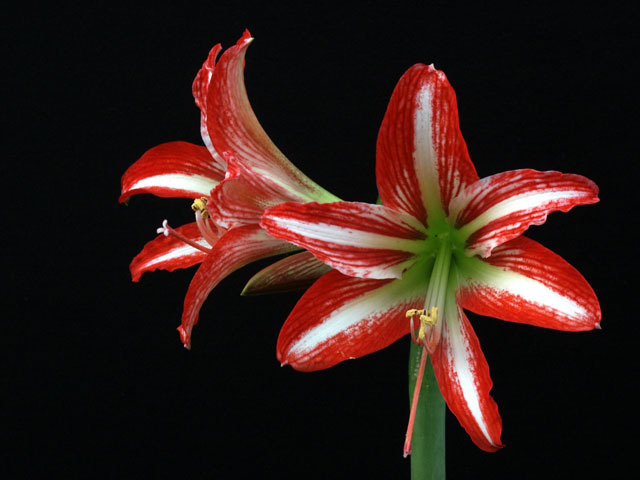 Hippeastrum is a genus in the family Amaryllidaceae with 70-75 species and 600+ hybrids and cultivars. 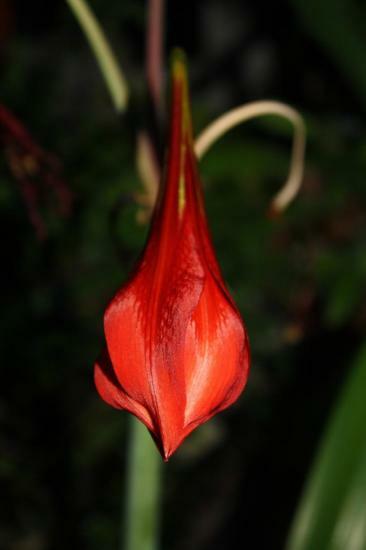 The genus is native to tropical regions of the Caribbean, Mexico and South America. 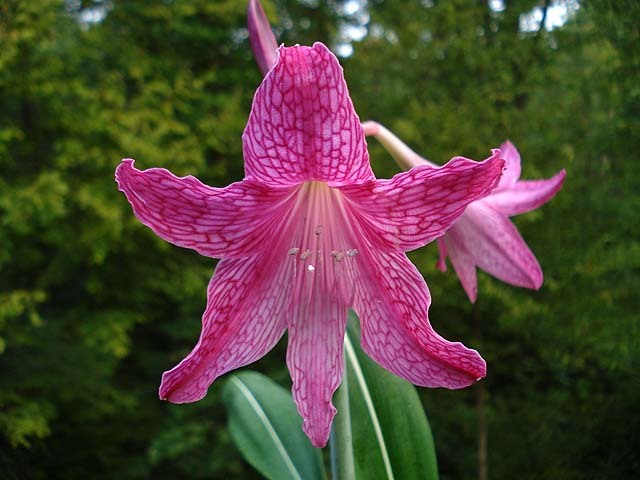 The Hippeastrum main page has information about cultivation and lists the species and hybrids that are included in the PBS wiki. 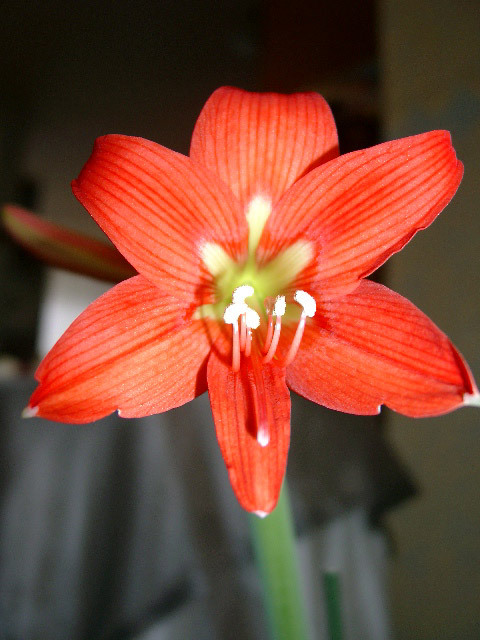 This page contains Hippeastrum species P-Z. 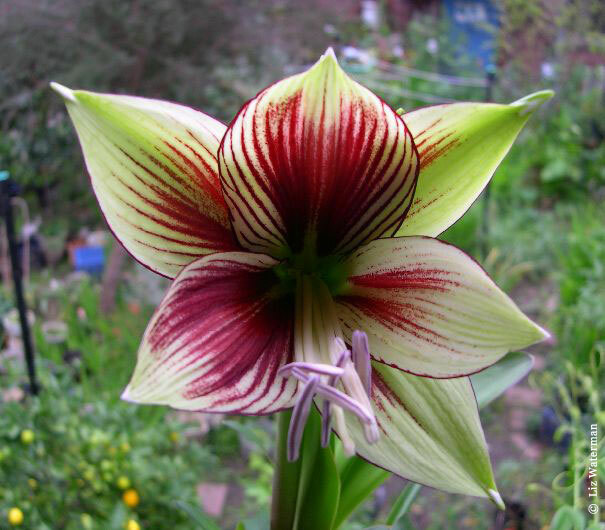 Other species are found on the Hippeastrum species A-O page. 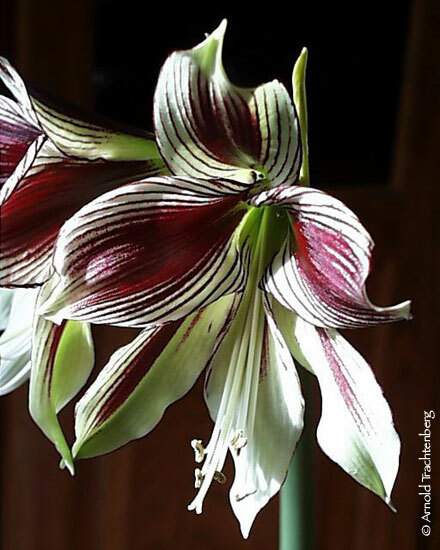 Hippeastrum papilio see the Hippeastrum papilio page. Representative photos of this species. Photo 1 was taken by Jennifer Hildebrand, photo 2 by Arnold Trachtenberg, photos 3-5 by Liz Waterman, and photo 6 by Mariano Saviello. 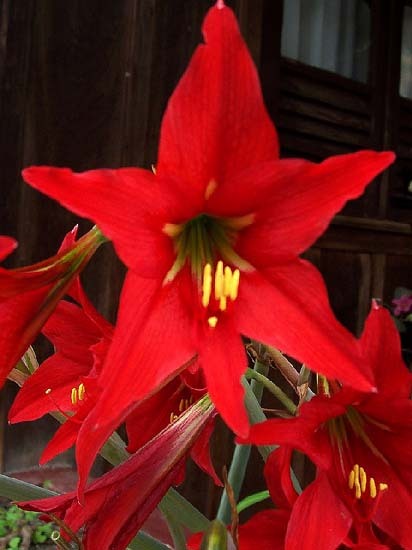 Hippeastrum parodii is native to Bolivia and northwestern Argentina and is considered a "tropical desert" bulb as it comes from hot "dryish" land. The tepals are white to cream to greenish-yellow. In habitat, plants receive rain from December-March (part of spring and summer). Dormancy takes place during part of autumn, winter, and part of spring. 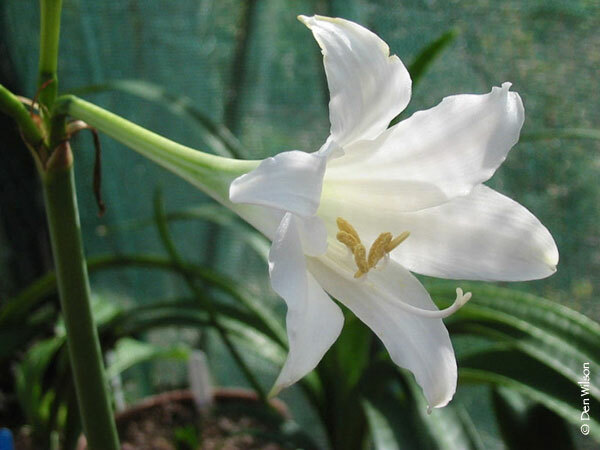 In cultivation, the bulbs are dormant for the winter and half the spring. Photo 1 from Doug Westfall taken July 2008. Photos 2 and 3 by John Carr, who discovered this population South of Timboy in Tarija province Bolivia. Plants were also seen north of the village. 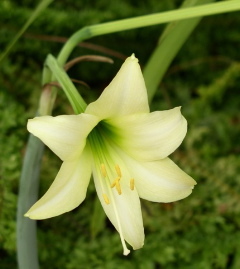 Hippeastrum petiolatum is from Argentina. This species is similar to H. striatum and H. puniceum. The following is a description of the species: Paraperigone of minute scales at the throat of the tepal tube. Tepal segments unequal in length, somewhat ruffled. Perigone 6-7 cm, tepal segments 1-2 cm broad at the middle. Bright scarlet-red with purple veins, greenish-yellow in the throat. Trifid stigma. 3 to 4 fowers, rarely 5 flowers. Photos by Doug Westfall. 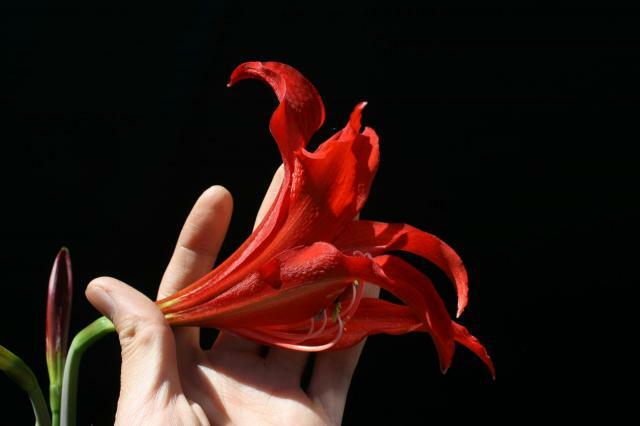 The first image (May 10, 2004) is very nearly the actual size of the flowers. This form is quite orange in color. 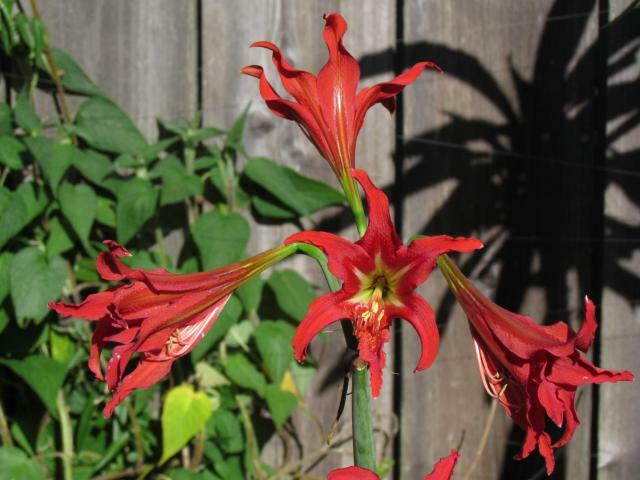 See Hippeastrum 1924 for what may be a long lived example. 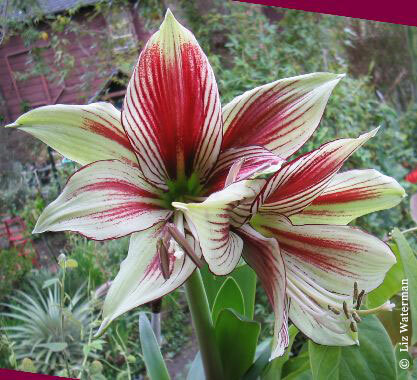 Hippeastrum psittacinum 'Atibaia' This plant was grown from seed by grower Chris Underhill in NSW Australia, who received seed from South America. 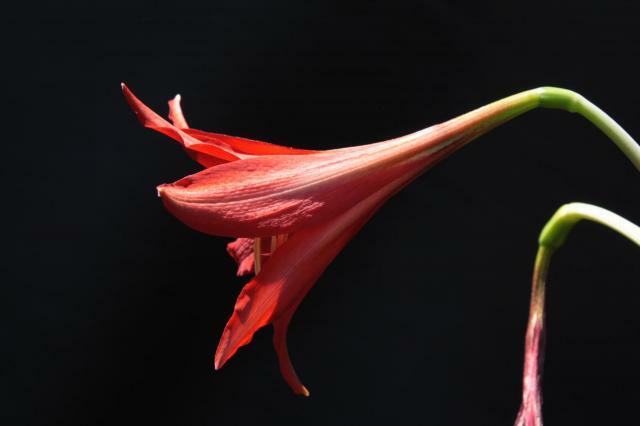 Allan Ladd took these photos on 13th September 2013 of the flower and the whole plant growing in his garden. Atibaia is a town in the south east of Brazil near São Paulo. The species is native to eastern and southern Brazil; psittacine means resembling a parrot. 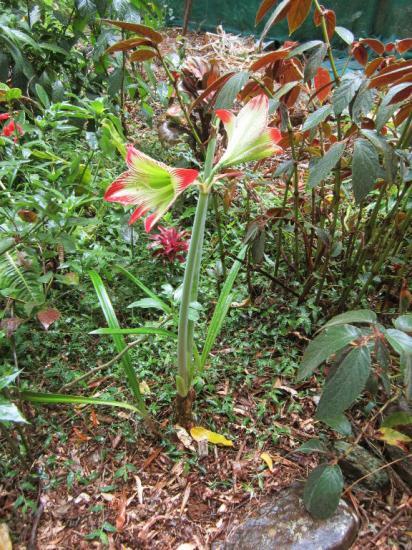 Hippeastrum puniceum is widespread in tropical Central and South America. This species is similar to H. striatum and H. petiolatum. The following is a description of the species: Paraperigone of obscure bristles at the throat. Perigone 10-13 cm. Tepal segments 3.2-3.8 cm at the middle (petal segments narrower, especially the lowermost), yellowish-green at the base. Bright scarlet, red or salmon. 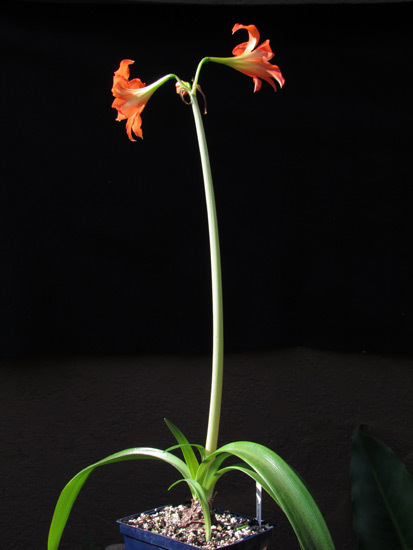 Capitate stigma (triangularly three lobed). 2-4 flowers depending the variety. 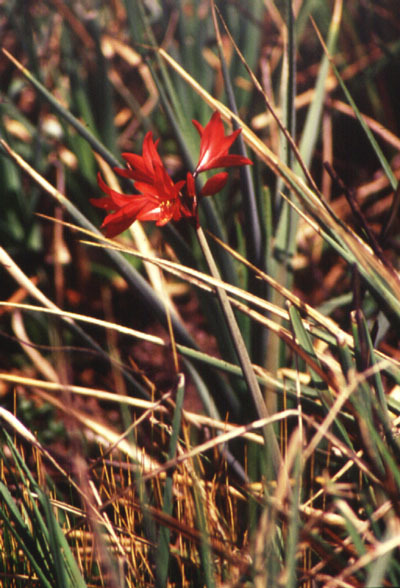 The first photo taken March 2004 by Lee Poulsen is of some bulbs he gathered down near sea level in Haleakala National Park on the island of Maui, Hawaii. Lee was struck by the color of the flowers, unlike other species he was familiar with. The second photo taken March 2004 by Cynthia Mueller, also identified by an earlier name, H. equestere, was found in Sealy, Central Texas. 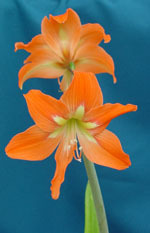 She described it as "Very orange - two blooms per scape, small plant. Self fertile." 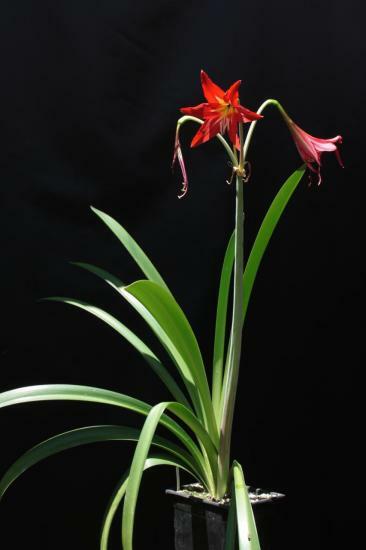 The third photo by Hans Joschko is of a plant that experts think looks like this species; the plant is from a friend of his and was collected from the Chaco in Bolivia. 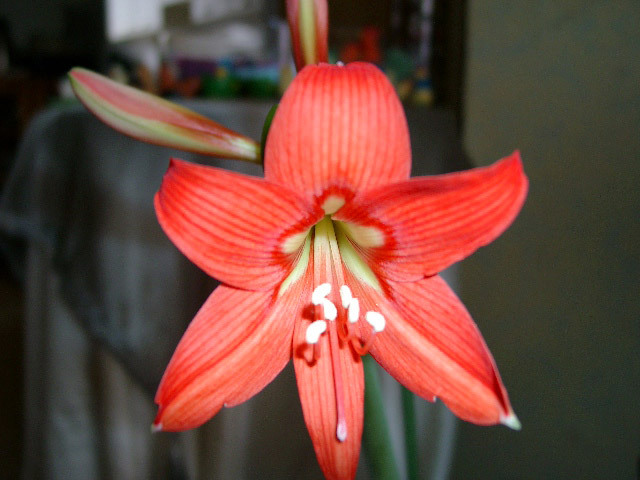 Hippeastrum puniceum var alberti (Baker 1888). 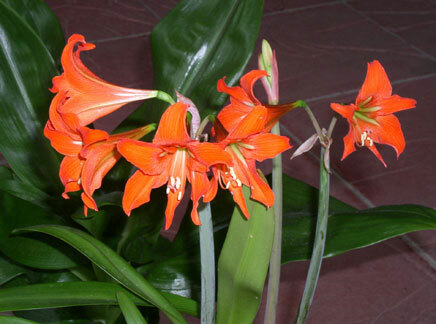 Synonyms Hippeastrum reginae (L) Herb var flore pleno, Hippeastrum fulgidum Herb. var flore pleno. 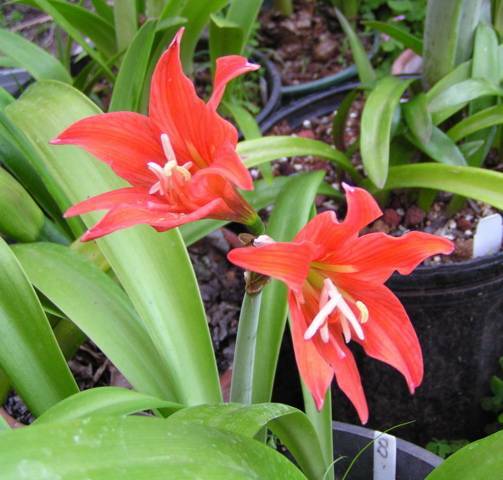 A native of the Antilles islands, it has a small bulb, 3- 4 cm and the foliage is also small 30-40 cms; there are 1 or 2 flowers in the scape. 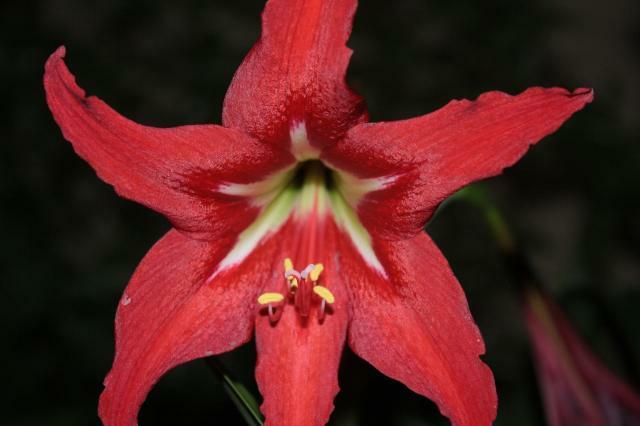 It is the only multi-tepal Hippeastrum, with 32 tepals, 2-3 functional stamens. 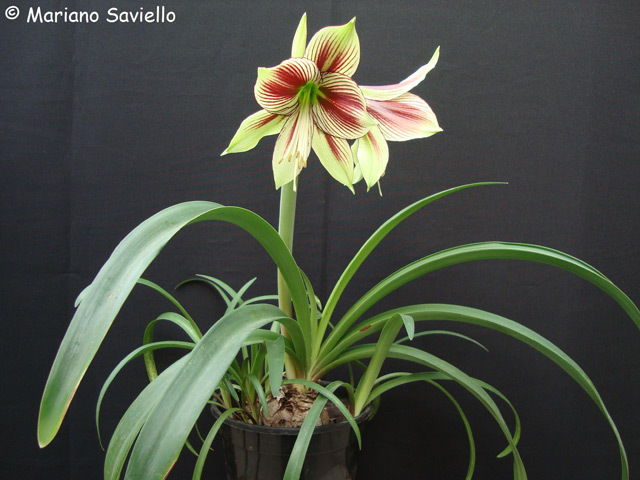 The crossing of var alberti with simple Hippeastrum produces the famous double hybrid Hippeastrum , or multipetal Hippeastrum . It thrives well in warm weather. Photos by Fabio Francisco Suarezmotta. 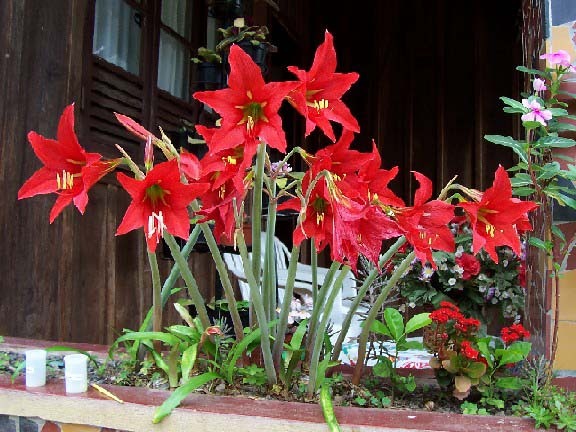 Hippeastrum reginae is a widespread species in South America. Photos 1-3 were taken August 2005 in southern Brazil by Tarcísio Eduardo Raduenz. Photos 4-6 were taken by Nhu Nguyen of seed-grown plants. The photos below by Nhu Nguyen shows some seedling variations of the species. 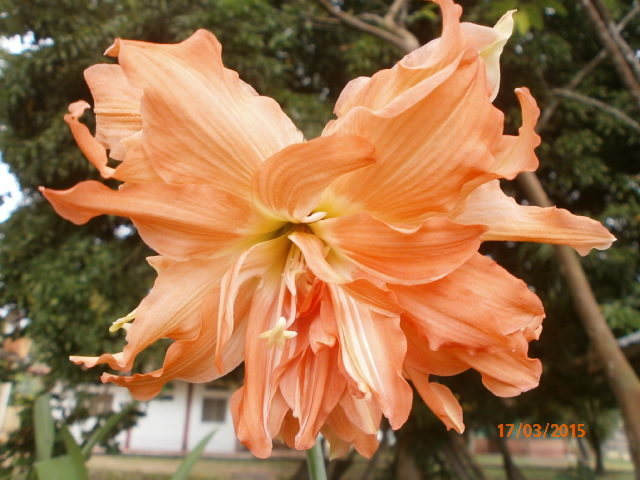 When these photos were taken, the petals were much thinner and wrinkled, but the following year they were much less so. 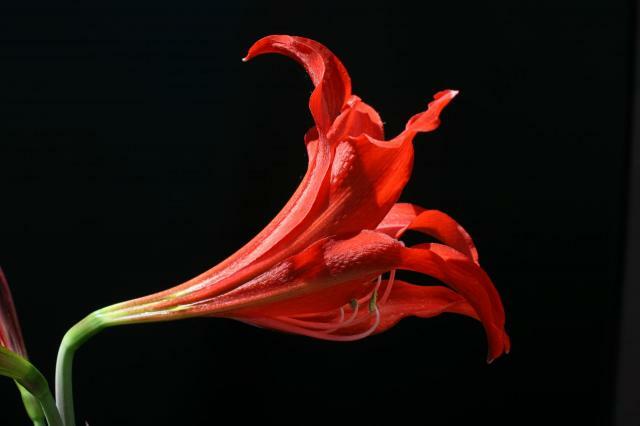 Petal development may be influenced by humidity. Hippeastrum reticulatum see the Hippeastrum reticulatum page. Representative photos of this species. Photo 1-4 were taken by Mariano Saviello, photo 5 by Alan Meerow, and photo 6 by Jay Yourch. 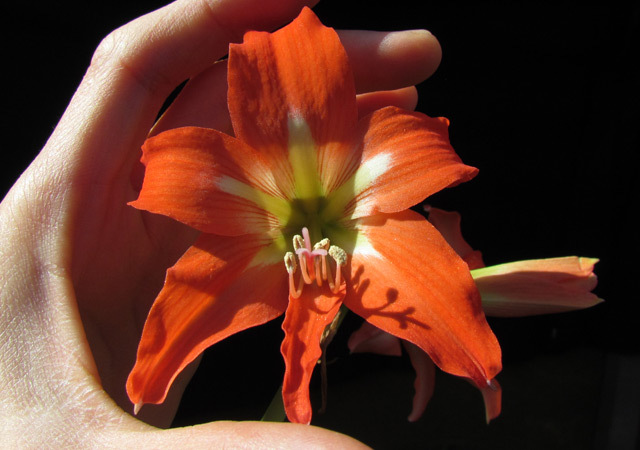 Hippeastrum santacatarina is a southern Brazil species with medium size flowers found growing in bogs. Photograph by Germán Roitman. 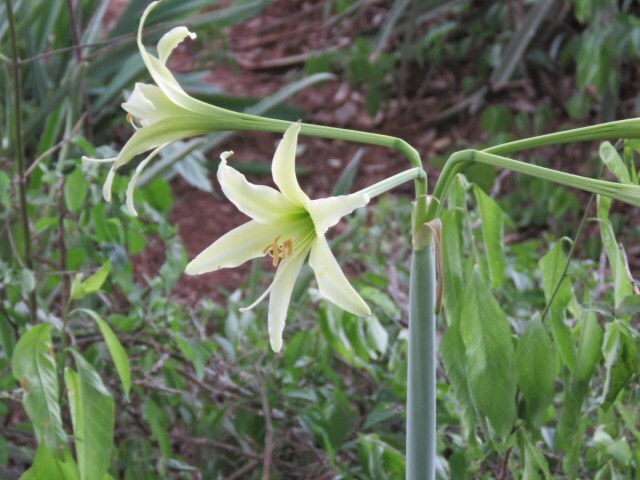 Hippeastrum solandriflorum: Deciduous, cool/dry in winter. 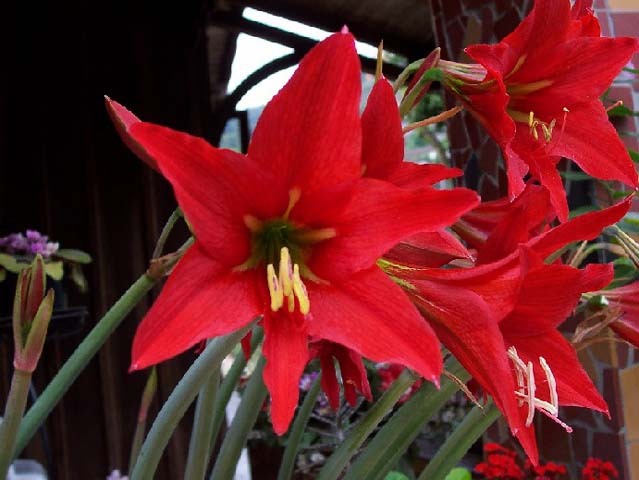 Requires a deep pot and plant with neck of bulb at soil-level. Photo by Den Wilson. 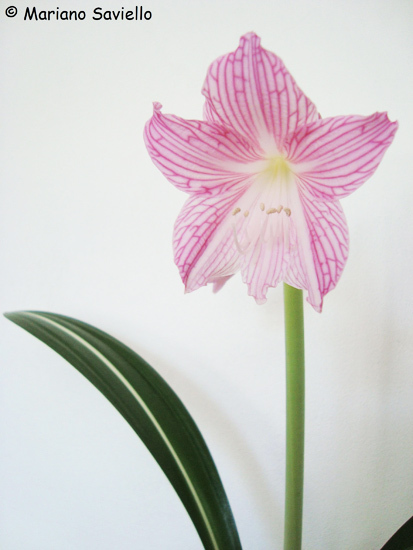 Hippeastrum sp. ex Cuzco was collected near Cuzco, Peru by David Victor. It could be H. cuxcoensis. Photo by David Victor. 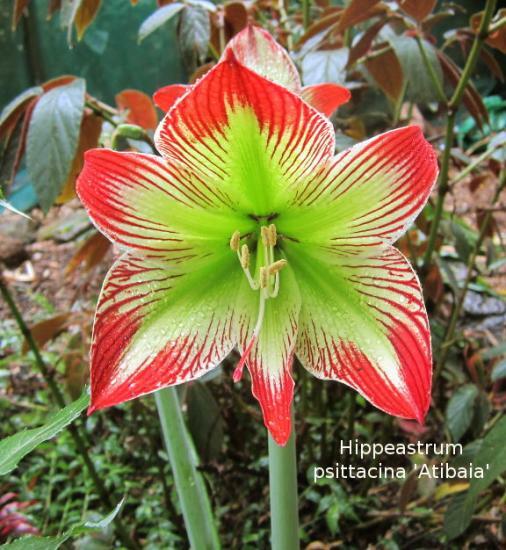 Hippeastrum striatum is native to Brazil. This species produces numerous bulbils that may be washed or broken off in nature. 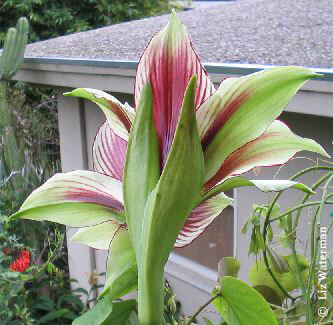 Because of this prolific production of bulbils, it has naturalized in tropical areas such as Hawaii. 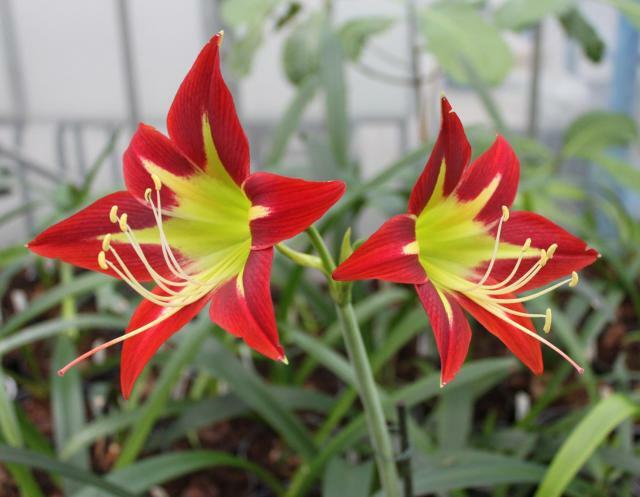 There is no special dormancy requirements to bloom this species which can occur in just 2 years from seeds. This species is similar to H. petiolatum and H. puniceum. The follow is a description of the species: Paraperigone of obscure bristles at the throat of the tepal tube. Perigone 7.6-10 cm, tepal segments 2-2.5 cm broad at the middle, bright nasturtium-red with a green keel extending halfway up the tepal segment. Trifid stigma. 2-4 flowers. Photo 1 below was from Lee Poulsen taken in April 2004. Lee says that "the flowers are much smaller than all my other hippeastrums, about 2 inches (5 cm) across and 3 in (7.5 cm) deep. Photo 2-4 were taken by Nhu Nguyen. Photos below taken by Ton Wijnen show a cross between the clones known as 'Petiolatum' and 'Saltão'. 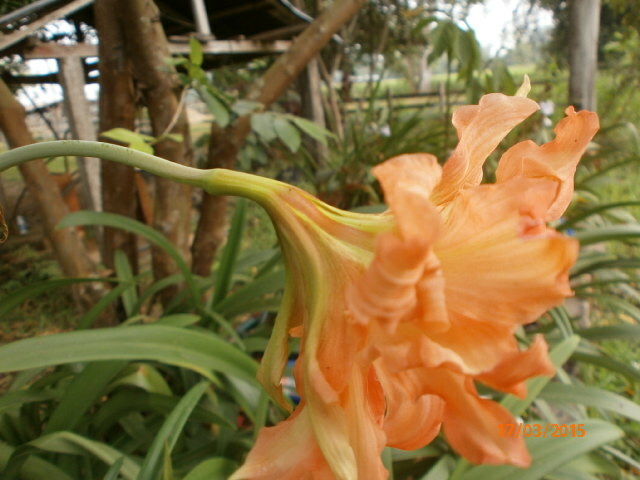 This plant seems to be widely cultivated. 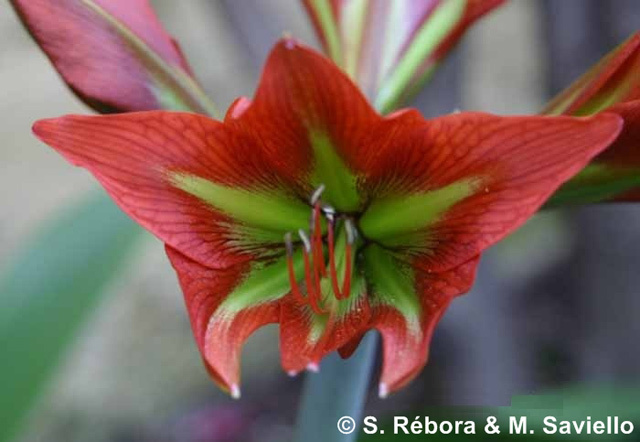 Hippeastrum teyucuarense (Ravenna) may be a synonym of the Brazilian species Hippeastrum glaucescens. 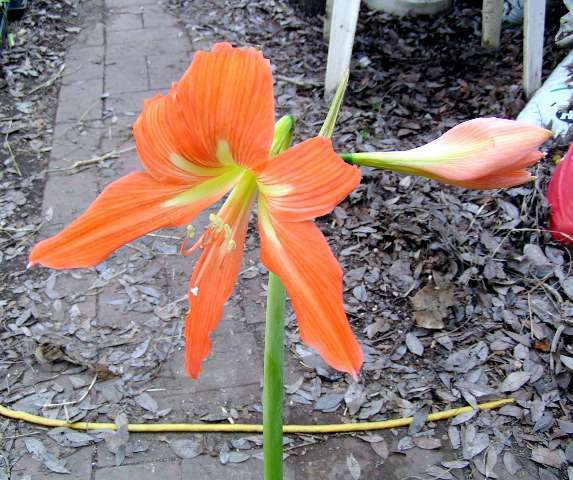 It has vivid orange brick veined flowers and is extremely rare in cultivation. A recent study by Daviña et al. 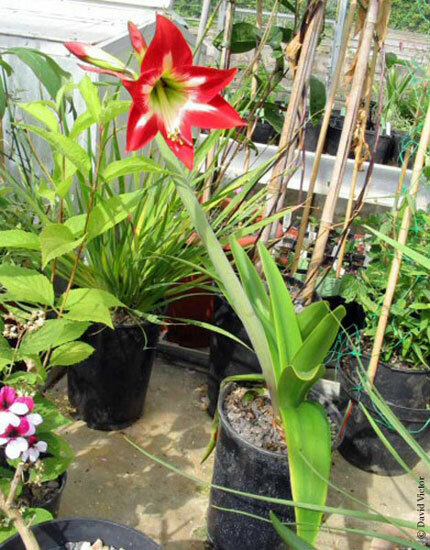 showed that similarities exist between this species and Hippeastrum iguazuanum and Hippeastrum glaucescens. This species has flat strap like leaves, whereas H. iguazuanum has leaves that are channeled and with the edges folded backwards. 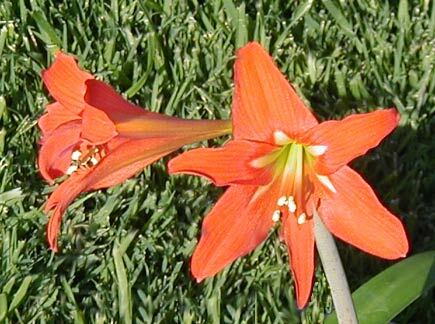 It is an early spring bloomer (September in the Southern hemisphere) and offsets as easily as H. iguazuanum. 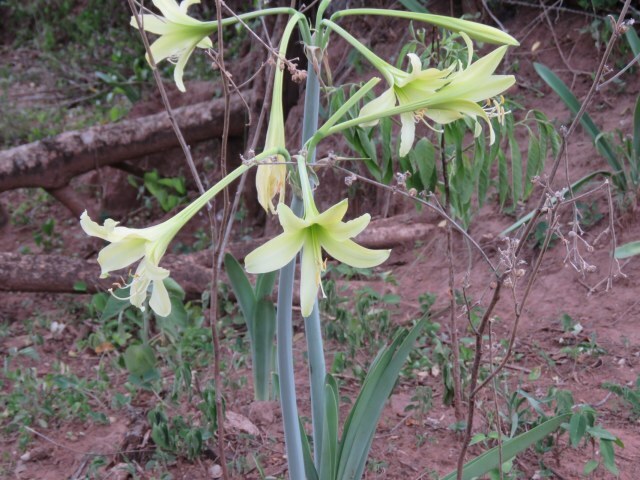 Hippeastrum teyucuarense has been reported to be found in San Ignacio (province of Misiones, Argentina). 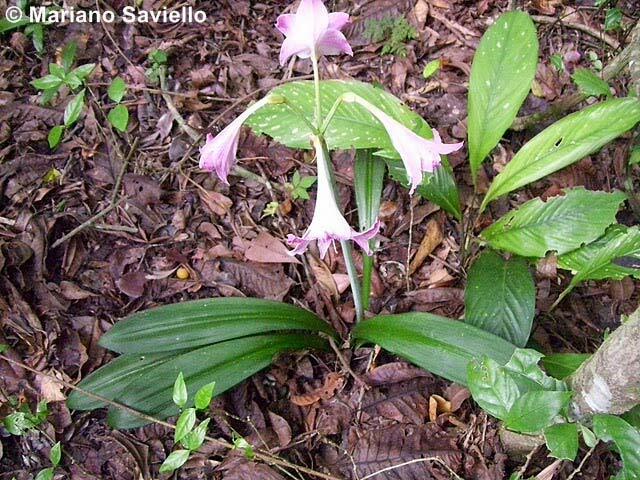 In Teyú-Cuaré Provincial Park, Province of Misiones, Argentina, it grows in a single hill called "Rock of Victoria" among rocks and rich soils. There has been another report of it growing in Corrientes as well. 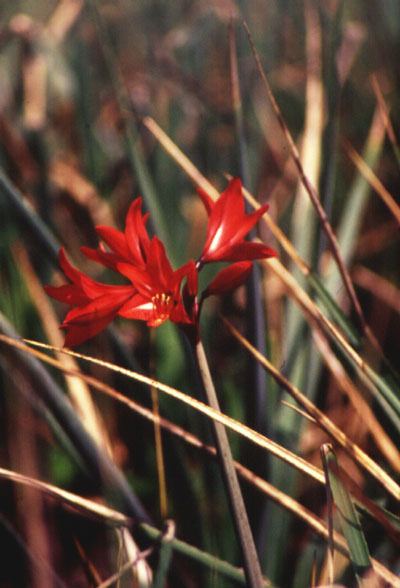 Local people – who call it "Red Lily" - used to dig it and take it home as a garden flower and, as a result, it is possible to see it in gardens forming clumps that are heavily virused. It sets no seed and it seems the offsetting form is the only one around. 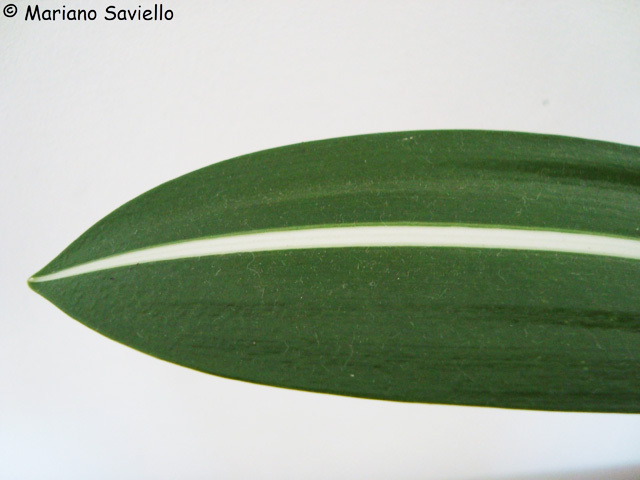 The leaf shape and the color is quite irregular. 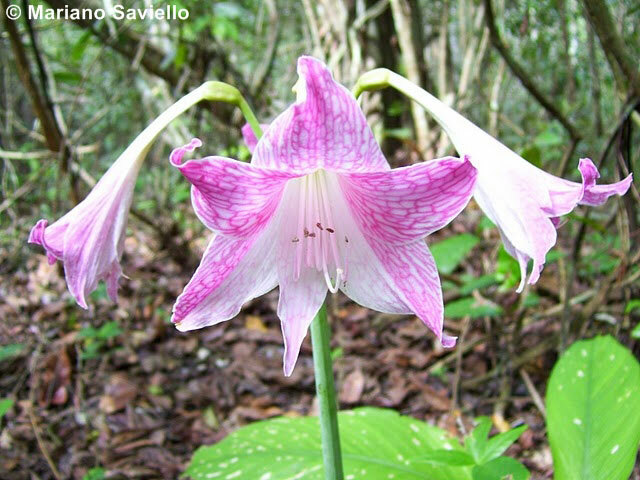 The photo below show a flower stalk with four flowers, taken by S. Rébora, a colleague of Mariano Saviello. 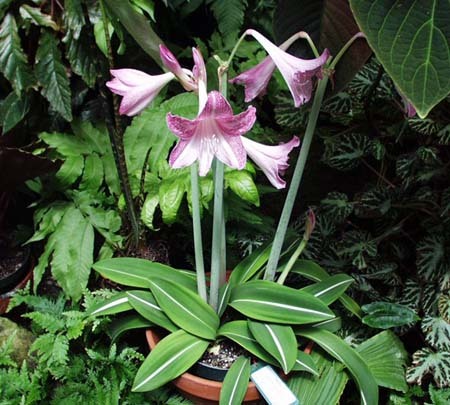 Hippeastrum vittatum is from Peru. Photograph by Kelly Irvin, April 2003. 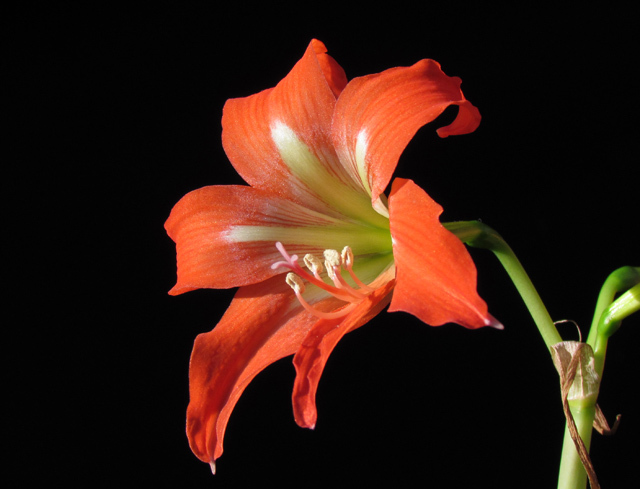 Hippeastrum yungacense (Cárdenas & I.S.Nelson) Meerow is native to Bolivia. It is named for the Yungas, a stretch of forest along the eastern slope of the Andes, from Peru and Bolivia to northern Argentina. 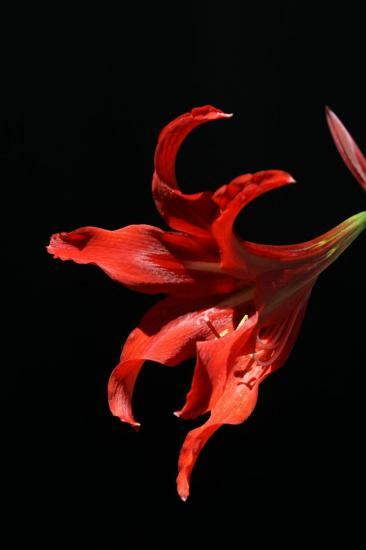 The photo was taken by Ton Wijnen of plant sold as Hippeastrum yungacensis 'Kiara'. 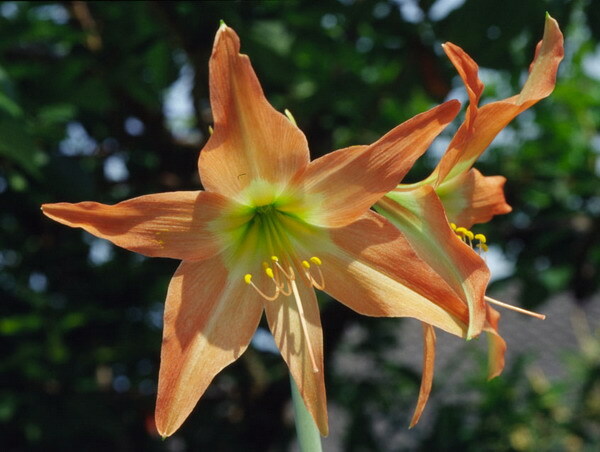 Hippeastrum yungacensis is not the correct spelling and probably came from Amaryllis yungacensis, it's older name.